Provides complete disk cloning and disk imaging1 of encrypted hard disks and hardware RAID arrays. AccuClone™ technology ensures a perfect image whether running natively from within Windows or from the Casper Secure Tech Edition customized boot environment. Compatible with virtually all 32-bit and 64-bit versions of Windows, including older versions such as Windows 9x/ME4. Virtual disk image file backups are supported only when running on Windows 7 and later or when booting and running from the Casper Secure Tech Edition Startup Disk. 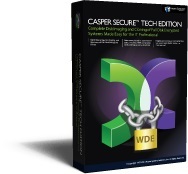 The VHDX image file format is supported only when running on Windows 8 and later or when booting and running from a Casper Secure Tech Edition Startup Disk created with the Windows 8.x ADK. Multi-boot configurations and Windows ME/9x systems supported only when booting and running from the Casper Secure Tech Edition Startup Disk.